Besides the conversion of XPS to PDF, PDFcamp Printer also can help you send PDF file to other people by email with no email box opened on your computer in Windows platforms. I think if you keep reading this article, you will find how amazing PDFcamp Printer is. 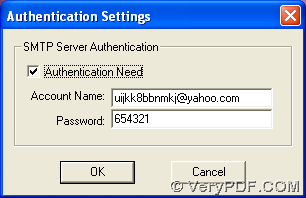 First of all, please download the installer of PDFcamp Printer from this link: http://www.verypdf.com/pdfcamp/pdfcamp_setup.exe, then you need to install PDFcamp Printer after you double click the installer on your computer and follow the setup wizard step by step till the end. Then, you can find your PDFcamp Printer appear on your control panel of your computer. 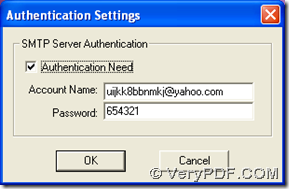 After you click “OK” on panel of “Authentication Setting”, please continue to click “OK” on preferences panel so that your setting on email can be saved automatically. Furthermore, all the panel can be closed automatically. Next, please open your XPS file on your computer, then please click hotkey of “Ctrl + P” there, then print panel can be popped on your screen. And you need to click “PDFcamp Printer” in “Select Printer”, then click “Print”, then after you save your PDF file, then PDFcamp Printer can help you print XPS to PDF and send email of PDF to other people. 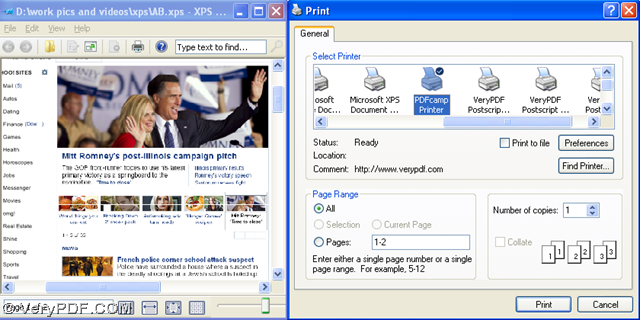 After you know the method to print XPS to PDF and send PDF by email to other people, if you want to know more of PDFcamp Printer, please go to its homepage at this link: http://www.verypdf.com/pdfcamp/pdfcamp.htm. And if you have any concerns about this process, please leave your comment here, and we will solve your problems as soon as possible. This entry was posted in PDFcamp Printer and tagged xps to pdf. Bookmark the permalink.